Acana cat food is manufactured and sold by Champion Petfoods, an award-winning pet food company with more than 25 years of experience in the pet food industry. The Champion Petfoods company was founded in 1985 by Reinhard Muhlenfeld and its headquarters and production facilities are located in Alberta, Canada. Champion Petfoods produces two brands – Acana and Orijen – both of which use locally sourced ingredients and nature-inspired recipes. The Acana cat food brand in particular makes three key promises about their products – biologically appropriate recipes, fresh regional ingredients, and never outsourced. The Acana cat food company markets their products as being “biologically appropriate” for cats and dogs. But what does this mean? According to Acana, their products are designed to nourish cats in two important ways. First, their formulas are developed according to the natural evolution of cats to follow a protein-rich, meat-based diet. Second, the ingredients used in Acana’s products are sustainably produced by local suppliers and delivered fresh to Acana’s “award-winning kitchens” every day. To summarize Acana’s mission, this company is dedicated to making “biologically appropriate dog and cat foods from fresh regional ingredients… from start to finish in our very own award-winning kitchens”. In adhering to this mission, Acana hopes that cat owners everywhere will come to love and appreciate their foods just as much as their pets do. 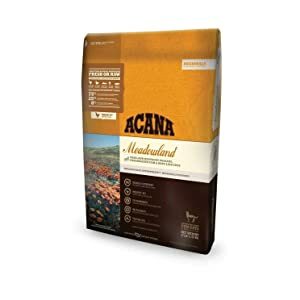 ​Rating: This Acana Meadowlands formula receives a Petlovetoday rating of 5 out of 5. ​Acana cat foods can be purchased at a variety of local and national chains including specialty pet food stores and some veterinary offices. You can use Acana’s Store Locator on their website to find local retailers and distributors of Acana products. You can also find a list of online distributors. ​Another phrase Acana uses to describe their formulas is “evolutionary diet”. According to Acana, their cat food products are designed to mirror the diets followed by the Eastern wildcat, the ancestor of modern domesticated cats. Acana suggests that although modern cats are very different from their wild ancestors, their eating anatomy has not changed. Thus, it is appropriate to assume that the biological and nutritional needs of domestic cats are still the same as those of their wild ancestors. Acana describes the “biologically appropriate” concept in this way: “mirror the quantity, freshness and variety of meats that nature evolved dogs and cats to eat”. Simply put, Acana’s products include only the kind of foods wild cats would have eaten and they exclude things like high-glycemic carbohydrates, vegetable proteins, synthetic additives, and other artificial ingredients. The Acana pet food brand uses fresh, regional ingredients in all of their formulas and it is a key component of their mission. Though the Champion Petfoods company was founded in Alberta, Canada, the Acana pet food brand is currently being produced in Kentucky at Acana’s new DogStar Kitchens facility. This facility was built from the ground-up with state-of-the-art technology, designed to adhere to the strictest standards of quality. Housed on 85 acres of Kentucky farmland, the DogStar Kitchens aims to produce the best, safest pet foods on earth. These kitchens are dedicated to exclusive production of the Acana and Orijen pet food brands and no other. The DogStar Kitchens facilities were designed to support Acana’s mission for producing biologically appropriate diets from fresh, regional ingredients. As such, they are equipped with 25,000 square feet of cooler space which is capable of holding more than 500,000 pounds of fresh local ​meats​, poultry, and fish as well as plenty of fruits and vegetables. While many pet food manufacturers market their ingredients as “fresh”, this is often not the case. Many manufacturers use pet-grade ingredients that have been frozen into giant blocks for transport and storage – these ingredients may be thawed and frozen multiple times before being used. This is not the case with Acana ingredients. Acana, on the other hand, is serious about using fresh and raw ingredients. ​The ingredients used in Acana cat food formulas fall into five categories. Heritage red meats like beef, pork, and lamb are raised naturally on local ranches in the heart of Kentucky. Free-run poultry and eggs are raised on local Kentucky farms and are classified as “fit for human consumption” before being delivered fresh to the DogStar Kitchens on a daily basis. Wild-caught fish are wild and sustainably caught from the cold, fertile waters of New England and shipped fresh to the DogStar Kitchens. ​Whole fruits and vegetables such as butternut squash and Bartlett pears are delivered fresh daily from local Kentucky orchards and farms. Locally grown botanicals like chicory root and rose hips are custom-grown by Kentucky farmers, delivered fresh or gently air-dried. ​When Acana says that their products are never outsourced they really mean it. Every one of Acana’s recipes is produced in the brand new DogStar Kitchens facility in rural Kentucky – these kitchens are dedicated to producing only Acana and Orijen products, no private brands. Not only are these kitchens dedicated solely to Acana products, but they follow the same standards for food safety and quality as the most reputable human food processing facilities. Unlike many pet food brands, Acana is not owned by a marketing company that outsources production – all of Acana’s products are developed and produced in their own kitchens, with their own ingredients, by their own cooks. ​The Acana Meadowland dry food recipe has been reformulated for the spring of 2016 and it represents Acana’s dedication to producing the safest, most high-quality cat foods on the market. This recipe is made with regionally inspired fresh local ingredients consisting of 75% meat, ½ fresh or raw ingredients, and it follows the WholePrey ratios. The Acana Meadowland formula is rich in protein and carbohydrate-limited, featuring fresh ingredients like free-run chicken and turkey, nest-laid eggs, and wild-caught fish. This recipe adheres to Acana’s WholePrey ratios which are inspired by the natural diet of wild cats which includes meat, organs, and cartilage is ratios that deliver complete nutrition without the need for synthetic supplements. ​Deboned chicken, deboned turkey, chicken giblets (liver, heart, kidney), chicken meal, catfish meal, turkey giblets (liver, heart, kidney), whole green peas, red lentils, pinto beans, pollock meal, chicken fat, chickpeas, green lentils, whole yellow peas, catfish, whole eggs, rainbow trout, herring oil, chicken liver, sun-cured alfalfa, natural chicken flavor, chicken cartilage, turkey cartilage, dried kelp, whole pumpkin, whole butternut squash, kale, spinach, mustard greens, collard greens, turnip greens, carrots, apples, pears, freeze-dried chicken liver, freeze-dried turkey liver, pumpkin seeds, sunflower seeds, choline chloride, zinc proteinate, copper proteinate, mixed tocopherols (preservative), chicory root, turmeric, sarsaparilla root, althea root, rosehips, juniper berries, dried lactobacillus acidophilus fermentation product, dried bifidobacterium animalis fermentation product, dried lactobacillus casei fermentation product. The Acana Meadowlands formula has a guaranteed analysis of 35% crude protein, 20% crude fat, and 4% crude fiber with a moisture level of 10%. Given this analysis and the list of ingredients shown above, it is easy to see that this formula is rich in high-quality protein and healthy fats with limited carbohydrates. The fact that this formula lists six animal proteins (including several organ meats) before the first carbohydrate earns this formula major bonus points and it is proof that Acana does in fact use the diet of wildcats as inspiration for their formulas. All of the carbohydrates used in this formula are low-glycemic and grain-free. The only one that is even slightly questionable is sun-cured alfalfa. Some pet food manufacturers include this grain-free carbohydrate as an added source of protein in replacement of meat – it is clear, however, that this Acana formula is not short on animal proteins so this ingredient is not something to be concerned about. This Acana Meadowlands formula contains plenty of healthy animal-based fats in addition to meat. Some quality examples include chicken fat, herring oil, and a variety of organ meats which contain both protein and fat. These fats have high bio-availability for your cat, especially when compared to plant-based fats like flaxseed and canola oil. This formula also contains fresh fruits and vegetables to meet your cat’s limited needs for dietary fiber and to bolster the formula’s nutritional profile. Other ingredients worth noting include dried fermentation products to aid digestion and chelated minerals. Chelated minerals are minerals which have been chemically bonded to protein molecules which makes them easier for your cat’s body to digest and absorb.